Have you ever tried to explain twitching to a non-birding friend? It might just sound like stalking to an outsider. But we always only have More... the best intentions towards our quarry, right? 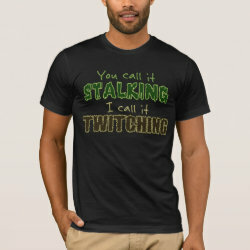 This funny text design reads "You call it stalking I call it twtiching" using an appropriately creepy font for "stalking" and a scratchy one for "twitching".